Count Alessandro Giuseppe Antonio Anastasio Volta was born was born in Como, Lombardy, duchy of Milan, on 18 February 1745. 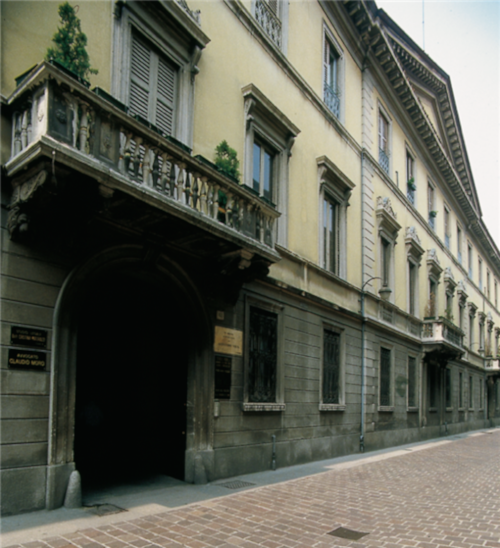 His native house is still preserved in the historic center of Como, Via Alessandro Volta 62 (see the image below). On the right of the main door of the house number lies the tombstone with the inscription: “This was the ancestral home of Alessandro Volta”. On the day after his birth, 19 February 1745, Alessandro was baptized in the nearby Provostal church of San Donnino (see below his birth record in the church register). Alessandro Volta came from a distinguished Lombard family, ennobled by the municipality of Como and almost extinguished at that time, through its service to the church. One of his three paternal uncles was a Dominican, another a canon, and the third (also Alessandro) an archdeacon. Alessandro's father, Filippo Maria Volta (born in 1692-died around 1752), after eleven years as a Jesuit, withdrew in early 1730s to propagate the line. 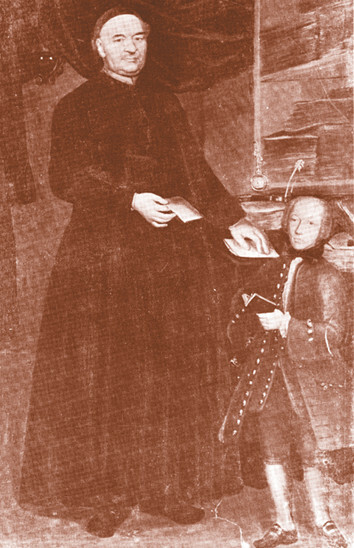 His marriage in 1733 to Maria Maddalena de'Conti Inzaghi (died 1782) (she was from a noble Lombard family, the daughter of Count Giuseppe Inzaghi from Gratz, Stiria) produced seven children who survived childhood; three girls, two of whom became nuns; three boys who followed the careers of their paternal uncles; and Alessandro, the youngest, who narrowly escaped church recruitment by his first teachers, the Jesuits. Alessandro spent most of his first years in the nearby town of Brunate, in the house of the artisan Ludovico Monti, a barometer builder. The Volta family was well-off and had several properties in the vicinity of Como, but it seems Filippo Volta was prodigal, because when he died around 1752, he left his wife and children not particularly rich. Luckily, in 1756 Alessandro and his brothers inherited the riches of a wealthy uncle. Alessandro's childhood was rather worrying and he learned to speak so late, that his parents even feared that he was born dumb. He said his first words when was four, and slowly, he learned to speak fluently as late as in the age of seven, but then he immediately began to reveal a lively curiosity towards natural phenomena, to the point that, in the anxiety of finding some shiny straws that, according to the local peasants, had to be gold, he risked drowning in the source of Monteverde, near Camnago. Unfortunately, Filippo Volta died around 1752, and the care of the younger children, Alessandro and his sisters Marianna and Chiara, was taken by their uncle Alessandro Volta, archdeacon of the Como cathedral. After elementary studies in the family, the boy entered in 1757, at the age of 12, the local Jesuit's School of Rhetoric in Como, and later was sent to continue his education at the Seminario Benzi. There his favorite authors were Tasso and Virgil and he amused himself by writing verses in Latin. Around 1760, Alessandro's teacher, the Jesuit Father Girolamo Bonesi, a philosophy professor, tried in vain to persuade him to follow the priesthood. His uncle, Alessandro, also attempted to persuade him to study law. However, having finished the Seminary, Volta decided to drop formal studies and he became interested in the electricity. Thus, by the age of sixteen, Alessandro already made up his mind to be a physicist. Next years he read the works of the greatest scientists of the time, and carried out his first studies on electricity between 1762 and 1765, together with his rich and eccentric friend, the future canon Giulio Cesare Gattoni (1741-1809). In 1774, Volta started teaching as superintendent of public schools in Como. The following year he became ordinary professor of Experimental Physics in the Gymnasium of Como. In 1777, he traveled for the first time with scientific purposes to Switzerland and France. Setting off in the company of count Giovio, he brought along physics tools to detect altitudes, barometric pressures and the quality of the air, and magnets for the search of iron minerals, besides obviously all the tools recently invented by himself. In 1778, Volta obtained the new chair of Experimental Physics at the University of Pavia. He held the chair of experimental physics at the University for nearly 40 years and was widely idolised by his students. Following the discovery of the native air of the marshes (methane) in 1778, he invented a series of tools and devices, among which the so-called Volta’s pistol and the musket that, it is told, he used to go hunting birds in the area of Campora, around Como. He is an extraordinary man. DeLuc is right: he wrote me once “qu’en Electricité Volta voyoit avec les yeux de Newton”. He is full of ideas and a raisonneur without peer. He had many instruments along; he unpacked them for me, and during his stay here I kept them in my own quarters. [...] He is a handsome fellow, and during some extremely uninhibited hours, at a supper at my place when we talked wildly till about one o’clock, I noticed that he has an expert knowledge of the electricity in girls. 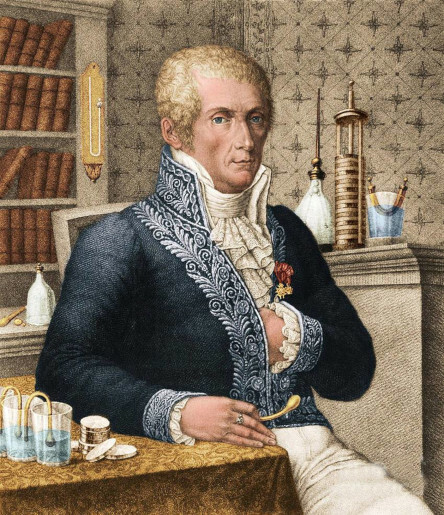 Just like his father, Alessandro Volta married at a venerable age to a much younger woman. Since 1789 he had a long love affair with a famous singer, Marianna Paris, but his family, and the emperor himself, did not allow the marriage, because the profession of singer was not of good repute. 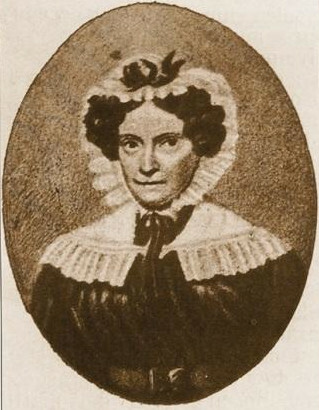 Thus Volta married on 22 September 1794 in the church of San Provino in Como, to Maria Teresa Alonsa Peregrini (born 1770), from a rich noble family. Surprisingly, the marriage was a happy one, and three sons were born: Zanino (1795-1869), Flaminio (1796-1814) and Luigi Tobia (1798-1876), Volta's pride and joy. Despite his professional success, Volta tended to be a person inclined towards domestic life and this was more apparent in his later years. At this time he tended to live secluded from public life and more for the sake of his family. 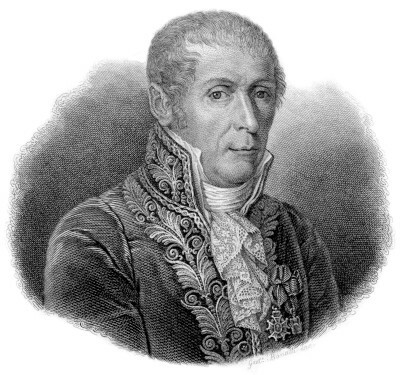 Alessandro Volta is said to have been one of the greatest and most brilliant experimenters of his time. 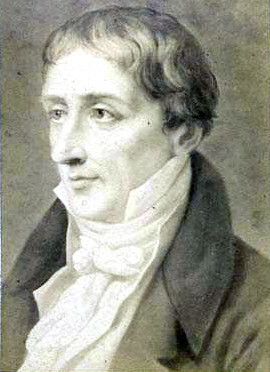 Volta retired in 1819 to his estate in Camnago, a frazione of Como (now named "Camnago Volta" in his honour). He died there on 5 March 1827, just after his 82nd birthday, and was buried in Camnago.